Succession Planning for Financial Advisors: Building an Enduring Business. 2014. David Grau, Sr.
Financial professionals who serve retail clients balance two primary tasks: providing expert investment management or advice and offering consistent and superior service to clients. Those who work for larger brokerage or advisory firms have much of the expertise, infrastructure, and procedures provided by their employers, but the growing number who choose to start and run their own businesses must develop these features by themselves. Despite independent advisers’ success at attracting clients — they are growing at a much faster pace than their larger competitors — author David Grau, Sr., finds that independent advisers fail miserably in one key area: succession planning. As head of FP Transitions, an Oregon-based consultancy offering practice management and succession planning advice, Grau has overseen the valuation, transition, and sale of thousands of independent practices and has provided continuity plans for thousands more. In his experience, only a very small percentage of practices ultimately get sold (most of which are one-owner practices). The remainder exit the business by attrition — that is, the gradual departure of clients over time as founders/owners spend less and less time in their practices and some clients find themselves underserved. Ironically, because these entrepreneurial owners fail to plan well for their own retirement, they not only squander considerable amounts of potential equity but also fail in their duty to see clients’ retirement plans through. Succession Planning for Financial Advisors: Building an Enduring Business is directed primarily at owners of independent advisory firms but should also be of considerable interest to their employees, their clients, and regulators, as well as investment professionals at larger firms who are considering the establishment of their own practices. Financial planners, insurance professionals, accountants, and other professionals in similarly structured practices will also benefit from the book. Although it focuses on the US context, readers from other countries will find that its central points are broadly applicable. Grau proposes three successive tasks. First, he says owners must change the way they organize their business. More specifically, they must shift from the “silo model” in which revenues are increased through the addition of advisers, each with a separate book of business, to an equity-based model in which the focus is on growing the central business. In this model, each employee receives a fair wage and, as outlined later in connection with the second task, a share of the rising business value. In the silo model, the best that the individual advisers can hope for in a sale is a modest multiple of their own recurring revenues. Owners are similarly disadvantaged, with poor leverage in negotiating a sale price with their “siloed” employees, who maintain the client relationships and retain the option of crossing the street to establish their own practices. It is far more effective and profitable for both owners and employees to avoid the silo model’s top-line revenue approach altogether and instead build a business focused on bottom-line profits, increasing business equity, and the intergenerational transfer of the equity over time. Owners who have not followed this model in expanding their business will need to change their advisers’ compensation structures. Grau outlines separate scenarios for bringing small-, established-, and “super”-producing employees into the fold as minority owners. Small producers are essentially in an employee/employer relationship already, so for them the shift should be fairly straightforward, but established producers have more negotiating leverage. Super producers come on board via a similar process, but rather than having a coach-class ticket into the overall business, they arrive with a first-class ticket. In each case, though, the advisers must be brought into the business by the owner communicating the business vision and plan, offering an immediate equity stake in the business in exchange for the producer signing over the right and title to the adviser’s book, and scheduling cash payments over time, financed by the growing business cash flow. To be clear, this is an immediate equity purchase in exchange for the rights to an asset, as opposed to the more gradual sale in a succession plan, as described later. When owners plan for continuity, key employees (usually other salespeople) forgo the job security and immediate financial gratification of owning their own books but, in turn, have a chance to own part of an enduring and far more profitable (and valuable) business. For those ready to expand beyond a sole practitioner firm or to shift from the silo model, the book outlines the most common structures available to US-based practitioners: S corporation, LLC taxed as a disregarded entity, LLC taxed as a partnership, and LLC taxed as an S corporation. Owners are appropriately advised to seek expert guidance before pursuing any of these legal structures. Grau outlines four subsequent steps: collecting all revenue into the legal entity’s centralized account; paying competitive wages for work performed; when necessary, paying bonuses tied to particular behaviors (but not based on production); and distributing profits, which can, in turn, help employees pay for the equity acquired from the founder. The key difference between Grau’s proposed business structure with profit sharing and the more common “percentage of revenues” setup is that, in Grau’s structure,all employees with equity shares or the potential for equity shares will begin to think like owners and shift their focus from pure top-line growth to bottom-line profitability. Once they have the proper business structure in place, the second task for owners (G1) is to create their succession team. Ideally, the second (G2) and potential third (G3) generation of owners will each include more than one candidate, making the continuity plan as robust as possible in the face of changing circumstances. Key advisers would normally be considered first for G2 ownership, whereas key employees without a book of business would be considered for either G2 or G3 ownership. The needs of each G1/G2/G3 practice setup are unique, but in general, owners are advised to start slowly, at first selling 5%–7.5% to each prospective owner. Independent practices in which the owner is the primary adviser may need to consider hiring from outside to set their succession plans in motion. In the meantime, however, these owners need to establish a continuity plan in case they find themselves unable to work. The plan must identify the triggering events (usually health related), provide for a valuation method, set reasonable payment terms (often financed through insurance), and outline the responsibilities of each party and the terms of replacement or transition. The two most common continuity agreements are revenue-sharing arrangements, which usually pay owners just 60–70 cents on each dollar of revenue, and buy–sell arrangements, which provide greater clarity and typically value the business at a much higher level. By way of comparison, Grau reports that the average valuation for fee-based practices is about 2.4 times trailing 12-month gross revenues whereas a business organized according to the book’s advice might fetch about 6 times trailing revenues. In short, advisers could realize up to 10 times more from a proper business structure and a planned sale compared with a poor business structure and the triggering of a continuity plan’s revenue-sharing arrangement. The third task the author lays out is for owners to plan for the transition of their practices over a long period, preferably 10 or more years. He claims that the best course involves a lifestyle succession plan, designed around the founder’s needs and goals and implemented by the divestiture of successive tranches of stock. The divestiture schedule should be commensurate with the decline in the founder’s hours and contribution and should be offered at regular intervals to G2 and then G3 employees. For businesses in which transitions over longer periods are infeasible, Grau details a quicker but less advantageous exit via the outright sale of the business to an internal candidate or an external third party. 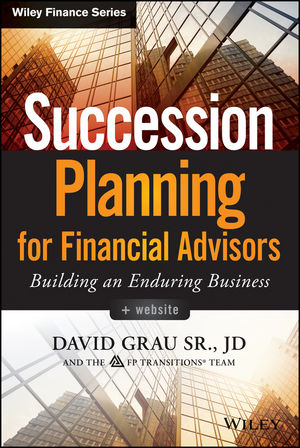 Grau also helpfully includes several pages on the particular nuances of succession within a family business. Grau offers considerable detail about the mechanics of a business transition, explaining how employee stock ownership plans work and why they offer little benefit to most succession plans. He also explains that owners should not confuse phantom stock plans with succession planning; they are compensation tools. Grau cautions at several points that founders should not give their ownership away and concludes the penultimate chapter by addressing some common challenges, such as next-generation employees who are not yet ready for ownership or who lack financing. The book concludes with a step-by-step guide to implementing the three tasks and supplements it with helpful online checklists, worksheets, and templates. Grau’s exhortation to seek professional guidance in establishing a practice and developing a succession plan is both gentle and appropriate and does not come across as self-serving. Readers will find him an articulate and experienced guide who offers eminently practical advice. Independent advisers who take his advice will likely realize ample financial rewards, but the most important benefits will accrue to clients in the form of continuity of service instead of a looming need to find a replacement adviser. More book reviews are available on the CFA Institute website or in the Financial Analysts Journal.